My erstwhile employer, mentor, and dearest friend was Dennis Flanagan, who edited Scientific American for 37 years. He is the larger of the two aquatic specimens in the photograph below. One of the quirks of life with Dennis was that he didn’t hear well, as a result of childhood ear infections. In an unpublished memoir he lists his deafness as a major influence on his path through life. It was a hardship in school, because he missed much of what his teachers were saying. On the other hand, it kept him out of the military in World War II. Later in life, hearing aids helped considerably, but only on one side. When we went to lunch, I learned to sit to his right, so that I could speak to the better ear. When we took someone out to lunch, the guest got the favored chair. In our monthly editorial meetings, however, he turned his deaf ear to Gerard Piel, the magazine’s co-founder and publisher. (They didn’t always get along.) In Dennis’s last years, after both of us had left the magazine, we would take long walks through Lower Manhattan, with stops in coffee shops and sojourns on park benches, and again I made sure I was the right-hand man. Dennis died in 2005. I miss him all the time. Although I was always aware of Dennis’s hearing impairment, I never had an inkling of what his asymmetric sensory experience might feel like from inside his head. Now I have a chance to find out. A few days ago I had a sudden failure of hearing in my left ear. At the time I had no idea what was happening, so I can’t reconstruct an exact chronology, but I think the ear went from normal function to zilch in a matter of seconds or minutes. It was like somebody pulled the plug. I have since learned that this is a rare phenomenon (5 to 20 cases per 100,000 population) but well-known to the medical community. It has a name: Sudden Sensorineural Hearing Loss. It is a malfunction of the cochlea, the inner-ear transducer between mechanical vibration and neural activity. An audiological exam confirmed that my eardrum and the delicate linkage of tiny bones in the middle ear are functioning normally, but the signal is not getting through to the brain. In most cases of SSNH, the cause is never identified. I’m under treatment, and there’s a decent chance that at least some level of hearing will be restored. I don’t often write about matters this personal, and I’m not doing so now to whine about my fate or to elicit sympathy. I want to record what I’m going through because I find it fascinating as well as distressing. A great deal of what we know about the human brain comes from accidents and malfunctions, and now I’m learning some interesting lessons at first hand. The obvious first-order effect of losing an ear is cutting in half the amplitude of the received acoustic signal. This is perhaps the least disruptive aspect of the impairment, and the easiest to mitigate. The second major effect is more disturbing: trouble locating the source of a sound. Binaural hearing is key to localization. For low-pitched sounds, with wavelengths greater than the diameter of the head, the brain detects the phase difference between waves reaching the two ears. The phase measurement can yield an angular resolution of just a few degrees. At higher frequencies and shorter wavelengths, the head effectly blocks sound, and so there is a large intensity difference between the two ears, which provides another localizing cue. This mechanism is somewhat less acurate, but you can home in on a source by turning your head to null the intensity difference. With just one ear, both kinds of directional guidance are lacking. This did not come as a surprise to me, but I had never thought about what it would be like to perceive nonlocalized sounds. You might imagine it would be like switching the audio system from stereophonic to monoaural. In that case, you lose the illusion that the strings are on the left side of the stage and the brasses on the right; the whole orchestra is all mixed up in front of you. Nevertheless, in your head you are still localizing the sounds; they are all coming from the speakers across the room. Having one ear is not like that; it’s not just life in mono. In my present state I can’t identify the sources of many sounds, but they don’t come from nowhere. Some of them come from everywhere. The drone of the refrigerator surrounds me; I hear it radiating from all four walls and the floor and ceiling; it’s as if I’m somehow inside the sound. And one night there was a repetitive thrub-a-dub that puzzled me so much I had to get out of bed and go searching for the cause. The search was essentially a random one: I determined it was not the heating system, and nothing in the kitchen or bathroom. Finally I discovered that the noise was rain pouring off the roof into the gutters and downspouts. In the first hour or so after this whole episode began, I did not recognize it as a loss of hearing; what I noticed instead was a distracting barrage of echoes. I was chatting with three other people in a room that has always seemed acoustically normal, but words were coming at me from all directions like high-velocity ping-pong balls. The echoes have faded a little in the days since, but I still hear double in some situations. And, interestingly, the echo often seems to be coming from the nonfunctioning ear. I have a hypothesis about what’s going on. Echoes are real, after all; sounds really do bounce off walls, so that the ears receive multiple instances of a sound separated by millisecond delays. Normally, we don’t perceive those echoes. The ears must be sensing them, but some circuitry in the brain is suppressing the perception. (Telephone systems have such circuitry too.) Based on my experience, I suspect that the suppression mechanism depends on the presence of signals from both ears. Similar to echo suppression is noise suppression. I find I have lost the benefit of the “cocktail party effect,” whereby we select a single voice to attend to and filter out the background chatter. The truth is, I was never very good at that trick, but I’m notably worse now. A possibly related development is that I have the illusion of enhanced hearing acuity for some kinds of noise. The sound of water running from a faucet carries all through the house now. And the sound of my own chewing can be thunderous. In the past, perhaps the binaural screening process was turning down the gain on such commonplace distractions. Even though no sounds of the outside world are reaching me from the left side of my head, that doesn’t mean the ear is silent. It seems to emit a steady hiss, which I’m told is common in this condition. Occasionally, in a very quiet room, I also hear faint chimes of pure sine tones. Do any of these signals actually originate in the affected cochlea, or are they phantoms that the brain merely attributes to that source? The most curious interior noise is one that I’ve taken to calling the motor. In the still of the night, if I turn my head a certain way, I hear a putt-putt-putt with the rhythm of a sputtering lawn-mower engine, though very faint and voiceless. The intriguing thing is, the sound is altered by my breathing. If I hold my breath for a few seconds, the putt-putting slows and sometimes stops entirely. Then when I take a breath, the motor revs up again. Could this response indicate sensitivity to oxygen levels in the blood reaching my head? I like to imagine that the source of the noise is a single lonely neuron in the cochlea, bravely tapping out its spike train—the last little drummer boy in my left ear. But I wouldn’t be surprised to learn it comes from somewhere higher up in the auditory pathway. One of the first manuscripts I edited at Scientific American (published in October 1973) was an article by the polymath Gerald Oster. Ordinary beat tones are elementary physics: Whenever two waves combine and interfere, they create a new wave whose frequency is equal to the difference between the two original frequencies. In the case of sound waves at frequencies a few hertz apart, we perceive the beat tone as a throbbing modulation of the sound intensity. Oster asked what happens when the waves are not allowed to combine and interfere but instead are presented separately to the two ears. In certain frequency ranges it turns out that most people still hear the beats; evidently they are generated by some interference process within the auditory networks of the brain. Oster suggested that a likely site is the superior olivary nucleus. There are two of these bodies arrayed symmetrically just to the left and right of the midline in the back of the brain. They both receive signals from both ears. Whatever the mechanism generating the binaural beats, it has to be happening somewhere inside the head. It’s a dramatic reminder that perception is not a passive process. We don’t really see and hear the world; we fabricate a model of it based on the sensations we receive—or fail to receive. I’m hopeful that this little experiment of nature going on inside my cranium will soon end, but if it turns out to be a permanent condition, I’ll cope. As it happens, my listening skills will be put to the test over the next several months, as I’m going to be spending a lot of time in lecture halls. There’s the annual Joint Mathematics Meeting coming up in early January, then I’m spending the rest of the spring semester at the Simons Institute for the Theory of Computing in Berkeley. Lots of talks to attend. You’ll find me in the front of the room, to the left of the speaker. My years with Dennis Flanagan offer much comfort when I consider the prospect of being half-deaf. His deficit was more severe than mine, and he put up with it from childhood. 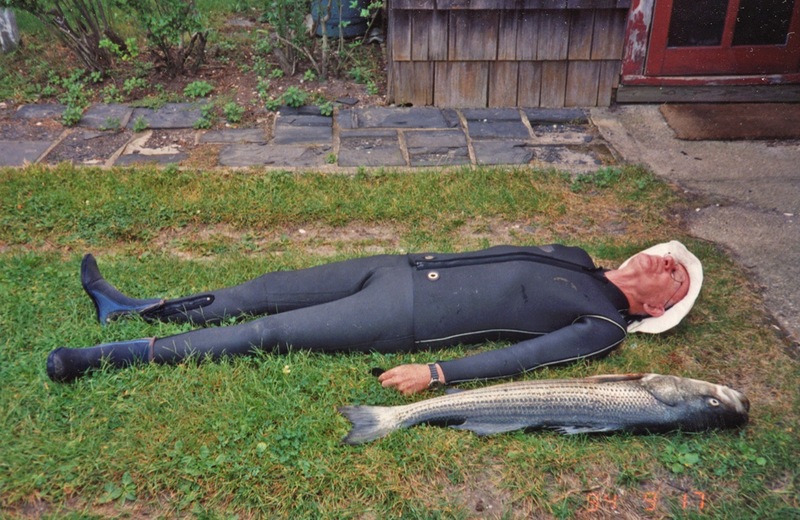 It never held him back—not from creating one of the world’s great magazines, not from leading several organizations, not from traveling the world, not from spearing a 40-pound bass while free diving in Great South Bay. One worry I face is music—will I ever be able to enjoy it again?—but Dennis’s example again offers encouragement. We shared a great fondness for Schubert. I can’t know exactly what Dennis was hearing when we listened to a performance of the Trout Quintet together, but he got as much pleasure out of it as I did. And in his sixties he went beyond appreciation to performance. He had wanted to learn the cello, but a musician friend advised him to take up the brass instrument of the same register. He did so, and promptly learned to play a Bach suite for unaccompanied cello on the slide trombone. This entry was posted in biology, off-topic. Hey Brian, this is of interest to me since I have, for ~15 yrs., suffered essentially the same condition you describe, and as soon as I can find time will write you an email about my experience. Anyway, will be interested to hear how things proceed for you, with what I suspect, sorry to say, is a permanent condition. My best wishes for a full and speedy recovery. I’ll be at San Diego, maybe I’ll run into you. At one point I started listening to music on headphones while cycling to work, and I was shocked by how much my spatial memory relied on auditory input. I would see cars and people and other bikes just fine, but as soon as I looked away they would just vanish from my internal world. Without my ears sending continuous messages about these obstacles they did not persist in any way. After three days of that and one too many close calls I decided my life wasn’t worth half an hour of Pink Floyd a day extra. Does this problem also occur when you lose directional hearing? Exact same here. I remember it well. Happened on a Saturday afternoon in 2003. However I waited too long before seeking treatment, the window of opportunity is only a few days then diminishes rapidly. I wish I had known, I waited a month thinking it would just correct itself. Hah. Only change since then is steadily increasing hiss volume, I guess the brain is trying to turn up the gain to find a signal. Strangest thing is I can now wear headphones and the sound still seems balance in the center (but I must set the output to monaural so both tracks go to my good ear).